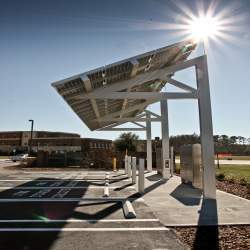 Great news...the Alternative Fuel Infrastructure Tax Credit has been extended one year to 12/31/2011, but reduced to $1,000 for Residential installations and $30,000 for Commercial installations. Whenever I talk to people about EVs, I try to emphasize the three key advantages for going electric: Electricity is Cheaper, Cleaner, and most of it comes from Domestic sources (in the US). To give me some proof points for an upcoming presentation, I spent some time analyzing energy data at www.eia.doe.gov and came up with these great points to support the transition to EVs. 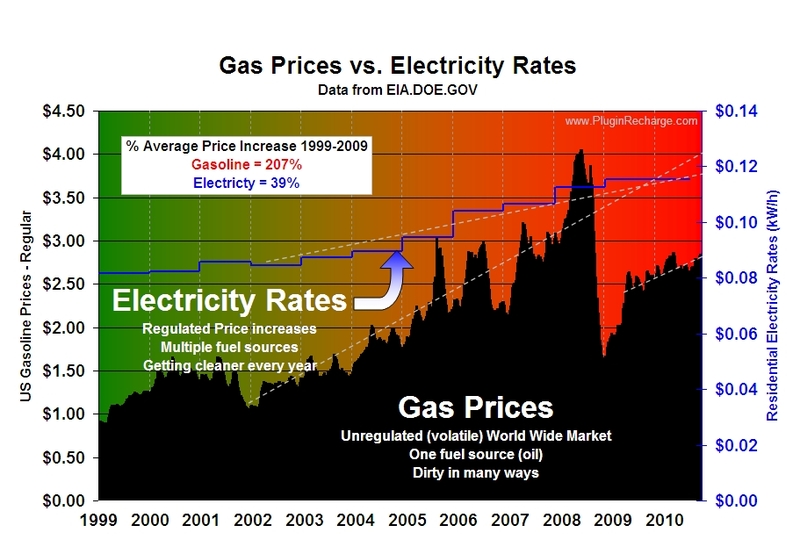 Historically (1999-2009), gas prices in the US have risen 5 times faster than electricity prices. While prices have collapsed since the Great Recession, they are rebounding quickly and should accelerate as the world's economy heals. 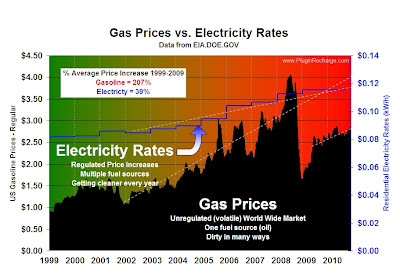 Electricity prices are regulated in the US and increase slower than oil prices. In the US, electricity prices increase after Public Service Commissions vote on proposed rate changes from electricity providers. These requests for rate changes are usually publicized which gives the public a chance to voice their opinion on their impact. This process is in stark contrast to changes in gas prices which are driven primarily by world crude oil prices and how much the oil companies want to charge for refining the oil to gasoline. No Gas Taxes: Now that gas tax increases are being discussed as a means of reducing the US deficit and paying for infrastructure improvements, it's likely that the US will see an increase in taxes either at the state and/or federal level that raises the price at the pump. Going Electric means that you get out of this tax until enough EVs are on the road to justify a change to a mileage tax on Vehicles. In the US, we consume over 22% of the worlds petroleum and we import 60% of it..which means we write big checks (>$200B) to a league of wacko nations including Canada for our energy every year. If we were smart (like Germany), we'd get real serious about reducing this demand and making our own power with renewables. A common objection I hear to going electric is that EVs simply move the emissions from tail pipe in the city to the smoke stack in the country. However, the data from the EIA tells me different. It's far easier to manage the emissions from a few thousand power plants vs. millions of vehicles. There are approximately 250 million vehicles in the US (with little verification on how much pollution they emit) and 1,436 coal powered generators in the US (with lots of verification of how much pollution they emit). From the table in the Domestic section above, you can see that the US is slowly reducing our use of the dirtiest and carbon rich fuels (coal and petroleum) and increasing our use of cleaner fuels (renewables and natural gas). Therefore, our electricity is getting cleaner and emitting less GHGs. Even the Conventional Power Plants (Coal) in the US are getting cleaner - they are emitting about 55% less Sulfur Dioxide and Nitrogen Oxides than 10 years ago. However, since coal is a carbon based fuel, it will always be dirty from the stand point of GHG emissions. So there you have it, some good sold data to support the transition to EVs. Electricity is Cheaper, Cleaner, and uses more Domestic fuel sources than Oil. While it will take a few years (10?) for battery technology to equal Gasoline's big advantage (energy density), it's only a matter of time.